Corn (Zea mays; Ukrainian: kukurudza). Hybrid annual of the cereal family and one of the most important seed and feed plants in the world. In Ukraine corn is third in importance after wheat and barley. 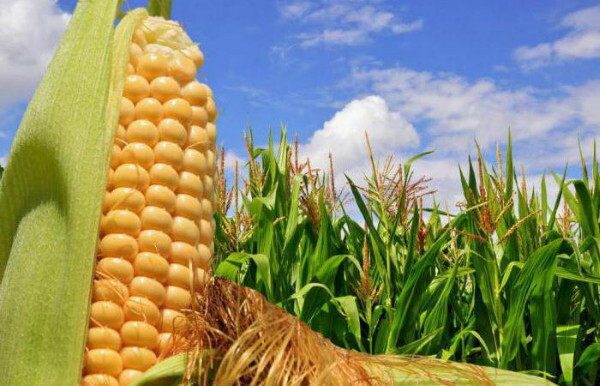 A kernel of corn contains 59–67 percent starch, 11–14 percent raw protein, and 4–8 percent fat. Corn is ground into flour and grits and is used to manufacture oil and sugar. The starch and liquor industries use large quantities of corn. Corn flour is unsuitable for bread baking, but is consumed in the form of corn meal (particularly in Pokutia and Transcarpathia) or is mixed (up to 25 percent) with wheat flour. Corn on the cob is eaten freshly cooked. Certain varieties of corn are grown as feed, and young plants are used as green feed or as silage. Corn is valued for its high yield of seed and silageable mass. The plant requires warmth and moisture during the flowering period, but it can tolerate lack of moisture in the first half of the summer. The best soils for it are well-fertilized sandy soils and clayey chornozem soils. In a rotational system corn is planted after winter cultures, spring wheat, legumes, or potatoes. In the southern regions corn is grown on fallow land after the main harvest. Corn is a good predecessor for winter and spring wheat. Of all the varieties of corn, Z. m. indurata is the most common in Ukraine. Corn began to be grown as early as the 17th century in Moldavia and the Crimea. In the 18th and 19th centuries its cultivation spread into the forest-steppe belt and the northern steppe belt. Before the Revolution of 1917 the main corn-growing areas were Pokutia, Bessarabia, and the adjacent parts of Podilia and Transcarpathia, where corn was the principal grain and the basic staple in the local diet. In the steppe (particularly the northern part) and in the southern part of the forest-steppe, 5–15 percent of the grain-growing land was devoted to corn. Prior to the Revolution most of the corn was used for feeding people, but some was used as animal feed, mostly for hogs. The stalks were used for fuel. From 1881 to 1913 the amount of land devoted to corn doubled. By 1913, 855,000 ha within the present boundaries of Ukraine were devoted to corn. After the Revolution the land area sown with corn increased greatly, particularly in the steppe belt. Corn growing became part of crop rotation, and corn partly replaced barley as fodder. In 1929, 2,300,000 ha were devoted to corn. In 1955 the January plenum of the Central Committee of the Communist Party of the Soviet Union approved plans to increase the amount of land devoted to corn, improve the yield of corn, and use corn as the basis of the mixed-feed industry. These led to radical changes in the production of corn: there was an increase in mechanization and agrotechnology in corn growing, new seeding methods and improved seed were introduced, and corn growing was extended to regions where the plant does not mature or is used only as green pasturage (Polisia). Within these plans Ukraine was assigned a leading role. Grain farming in Ukraine became dominated by corn growing; this in turn led to an overwhelming emphasis on animal husbandry in Ukraine's agriculture. The land area devoted to corn in Soviet Ukraine increased from 2,300,000 ha in 1954 to 3,543,000 in 1955. (Table 1 shows the expansion of corn growing in the Ukrainian SSR.) But by the second half of the 1950s the ‘corn fever' had died down, in terms of both the area devoted to corn seed (from 3,543,000 ha in 1955 to 3,037,000 ha in 1960) and the land devoted to silage and green feed (7,479,000 ha in 1960 and 4,375,000 ha in 1965). Table 1 and Table 2 show changes in corn growing from 1913 to 1980. The gross yield of corn seed in 1979 was as follows (in millions of tonnes): Ukrainian SSR, 4.0; USSR, 9.0; world, 396. The corresponding yield in centners per hectare was 32.2, 35.2, and 30.8. Half of the area devoted to corn in Ukraine is in the northern and central steppes, one-third is in the forest-steppe, and 12 percent is in the southern steppe. Thirty-five hybrids and two varieties of corn are grown in Ukraine. Scientific research on the selection and cultivation of corn is conducted at the Scientific Research Institute for Corn in Dnipropetrovske.